This was a gift to my friend, Ron Chan, for his birthday. 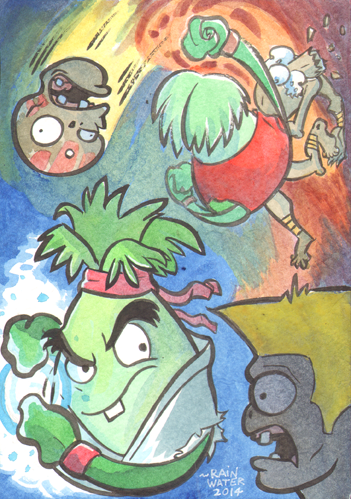 We both worked on Plants Vs Zombies: Lawnmeggeddon (Ron: Pencils and Inks, Me: Colors) and are both big fans of that game as well as Street Fighter (I’m a particularly big fan of SF3), so it seemed natural to bring the two together. This piece was finished in ink and painted in water-color.